Lora Jones has always known that she’s different. On the outside, she appears to be an ordinary sixteen-year-old girl. Yet Lora’s been keeping a heartful of secrets: She hears songs that no one else can hear, dreams vividly of smoke and flight, and lives with a mysterious voice inside her that insists she’s far more than what she seems.Raised in an orphanage in a rough corner of London, Lora quickly learns to hide her unique abilities and avoid attention. Then, much to her surprise, she is selected as the new charity student at Iverson, an elite boarding school on England’s southern coast. Iverson’s eerie, gothic castle is like nothing Lora has ever seen. And the two boys she meets there will open her eyes and forever change her destiny. I am a huge fan of dragons, so it always makes me excited to read about them. When I saw The Sweetest Dark had dragons and a boarding school, I didn’t hesitate to snap it up. The elements, combined with the looming backdrop of England during World War I, were certainly a part of this novel. Unfortunately, this novel just didn’t end up being what I was hoping for. The dragon lore is unusual. I obviously loved the magical, original lore behind the dragons in this novel. The author wrote her dragons in a way that I’ve never encountered before, and this worked well for me. I liked the fact that I didn’t really know what to expect when it came to the dragons, and so the entire things felt very new to me. A little practical magic never hurt anyone… right? Of course, most of the magic is related to the dragons – that’s a given. But there’s also the magic of alchemy in this book, which I always find interesting. The manifestations of magic were pretty darn cool and visually appealing, and the way that Abe wrote it was good. The settings were really well-written. I’ve always found boarding schools curious places, as they allow for strict discipline and independence all at once. The boarding school in this book is set apart from the city, as it’s on a little island of its own. The school itself is a fantastic setting, filled with cavernous rooms and unexpected passageways. But I also adored the outdoor settings – the gardens, the forest, the beach. The variety of settings was very well-done, as I was fascinated by them all. I couldn’t form a connection with the characters. I always find it more difficult to enjoy a novel if I can’t find a way to form even the most tenuous connection with its characters. Sadly, I was unable to connect with the characters in this novel, even though I wanted to. I always felt slightly removed from them, and that made me feel slightly removed from the novel. The romance wasn’t my cup of tea. There are certainly sweet, romantic moments in this novel. While I enjoyed them, I found that I wasn’t truly invested in the relationship(s) at all. This has a lot to do, of course, with what I already mentioned about the characters. But it also felt like the relationship was too out of left field, even though I could see that there was a semi-logical reason behind its development. I found the writing also was not my cup of tea. There was an inconsistency to the way this was written, with switches from simpler phrases to more descriptive, purple prose. I was often bothered by the random shifts, although I’m not sure it would bother anyone other than me. 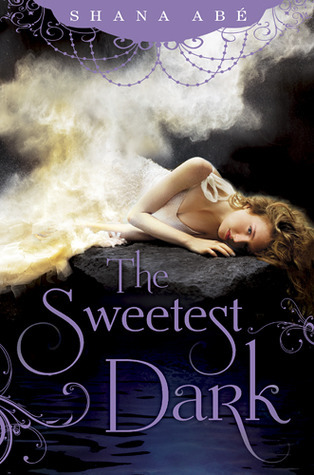 I really wanted to like The Sweetest Dark, especially as it sounded like a book that would appeal to me. It did present some potential to be a story that I’d like, with the magic and the dragons and the interesting setting. But it just didn’t work for me at all, especially when it came to the characters and the writing. Unfortunately, The Sweetest Dark was just not all that sweet to me and instead, fell flat. I actually enjoyed the writing, mostly because I thought all the purple prose (thank you for giving it a name!) was pretty. Other than that... I felt iffy about this one. I enjoyed it, sure, but ended up not liking many of the characters. Nor the romance. I've got a copy of the second book in the series, so I'm hoping maybe it lives up more to my expectations? I have no patience for books featuring characters and romances that aren't compelling. What a shame though, since the world building sounds pretty good. I usually struggle with a book too if I can't connect with the characters and, sadly, sometimes the romance plays a large part in that. This does sound very intriguing otherwise though. I would never have guessed it involved dragons just looking at that cover! I think it's probably wise if I skip this one for the time being. I do have many other titles to get to. :) Lovely review, Alexa! Sounds Interesting! I must check this book at my favorite online bookstore.. I know what you mean about the characters-I persevered because I liked the dragon elements but they didn't really pop. I always thought fantasy books work best when characters are more important than fantasy elements, and this book delivers. The characters are vivid. The love story is romantic without being crude. The setting is by turns beautiful and spooky. Lora's transformation feels natural. The language is beautiful. It's all very well done. I recommend this book to fans of the fantasy genre. I think it is going to be a big hit.